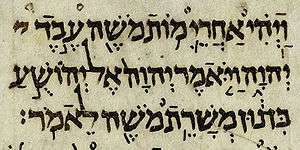 The Additions to Daniel comprise three chapters not found in the Hebrew and Aramaic text of Daniel. The text of these chapters is found in the Koine Greek Septuagint, the earliest Old Greek translation. They are accepted as canonical and translated as such in Roman Catholic, Eastern Orthodox, Oriental Orthodox, and Syriac Bibles. They are listed in Article VI of the Thirty-Nine Articles of the Church of England. However, most Protestant Bibles exclude these passages as Biblical apocrypha, retaining only the text available today in the Hebrew/Aramaic manuscripts. The Prayer of Azariah and Song of the Three Holy Children: Daniel 3:24–90 inserted between verses 23 and 24 (v. 24 becomes v. 91) in the Protestant canon, incorporated within the Fiery Furnace episode.